Competition is a great way to hone and refine your skills. With the Magtech 124gr 9mm Lead Round Nose, your training to become competition ready has never been more easy or affordable. 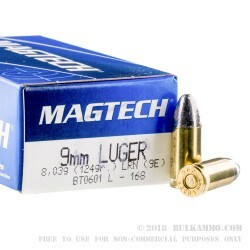 Magtech 124 grain 9mm LRN ammunition is approved for all indoor ranges, and easily reclaimed to reduce environmental waste. 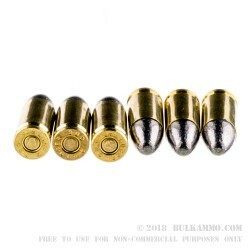 The jacketless 124gr lead round nose bullets work exceedingly well with steel targets, and reduce the chances of harmful ricochets when shooting up close and personal to simulate combat within an urban environment. 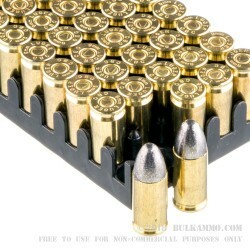 At a velocity under 1,100 feet per second, lead fouling is minimized in order to keep your barrel clean and ready for extended courses of fire. 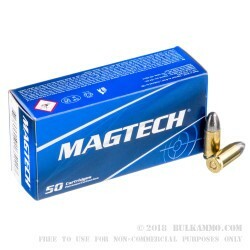 Brass cartridges are easily reloaded by shooters looking to extend their training dollars even further, and at a price point that is already one of the most competitive in the market today, the Magtech 124gr 9mm LRN is the ideal range ammunition for high volume shooters looking to perfect their skills without having to take on a second job to finance their passion.